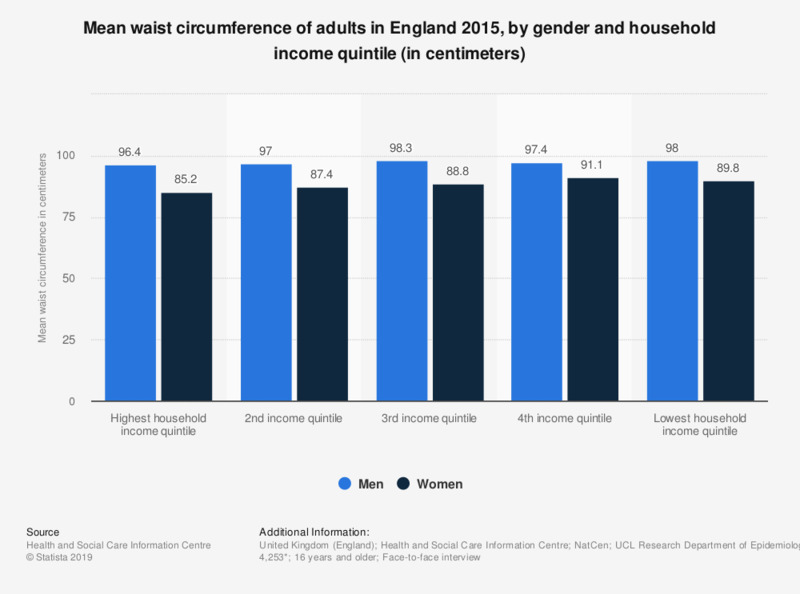 This statistic displays the waist circumference of adults in England in 2015, by gender and household income. In this year, men in the highest household income quintile had a mean waist circumference of 96.4 centimeters and women in the highest household income quintile had a mean waist circumference of 85.2 centimeters. * Weighted bases: n (men)= 2,110; n (women)= 2,144. - high waist circumference: 94-102 centimeters in men and 80-88 centimeters in women. - very high waist circumference: greater than 102 centimeters in men and greater than 88 centimeters in women, referred to as 'raised waist circumference' in previous HSE reports. Everything On "Diet and body mass index in the United Kingdom (UK)" in One Document: Edited and Divided into Handy Chapters. Including Detailed References. Statistics on "Diet and body mass index in the United Kingdom (UK)"
Workplace health and wellness in the U.S.
Millennials and health in the U.S. Racial and ethnic health disparities in the U.S.
Hispanic health in the U.S.
College student health in the U.S. Rural and urban health in the U.S. Which, if any, of the following dietary restrictions applies to you?